When Ardashir defeated the Parthians, he saw himself reconnecting with the Persian empire of the Achaemenids - after the unfortunate 600 year hiatus involving Alexander, the Seleucids, and the Parthians. 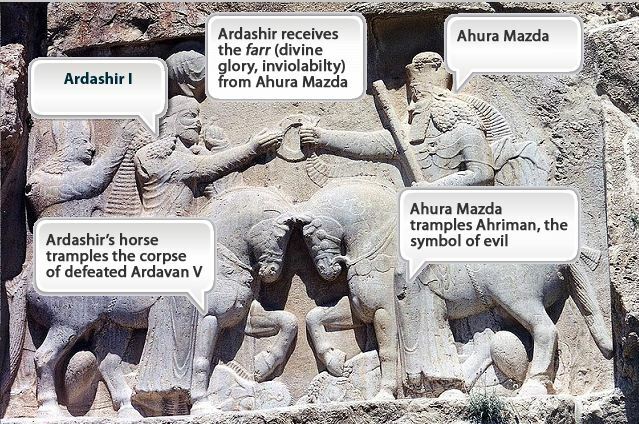 Like Darius the Great, he feels he owes his power to Ahura Mazda - and he shows himself, like Darius on the Bisitun inscription, trampling his defeated enemy underfoot: for Darius this was the "false Smerdis", Gaumata, for Ardashir it was the Parthian Ardavan IV. Notice how similar the king and the god are. The relief was carved into the rock below the Achaemenid tombs at Naqsh-i Rustam, in Fars near Persepolis. Ardashir probably did not know the true identity of his Achaemenid predecessors, but he still wanted to be connected with these former kings, whoever they were. His origin is not clear. There are numerous unconvincing stories, from which the information derives. He was born around AD 180, in Persis (Fars). His father was called Papag (or Babak or Papak). 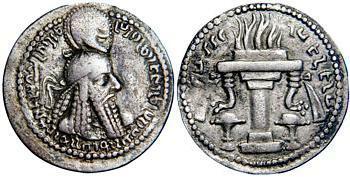 Sasan was a hereditary Zoroastrian priest in the fire-temple of Anahita in Istakhr, allegedly descended from the Achaemenids, who may (or may not) have been Papag's father, and hence Ardashir's grandfather. Or was Sasan, as others claim, the actual father of Ardashir, who was later adopted by Papag? 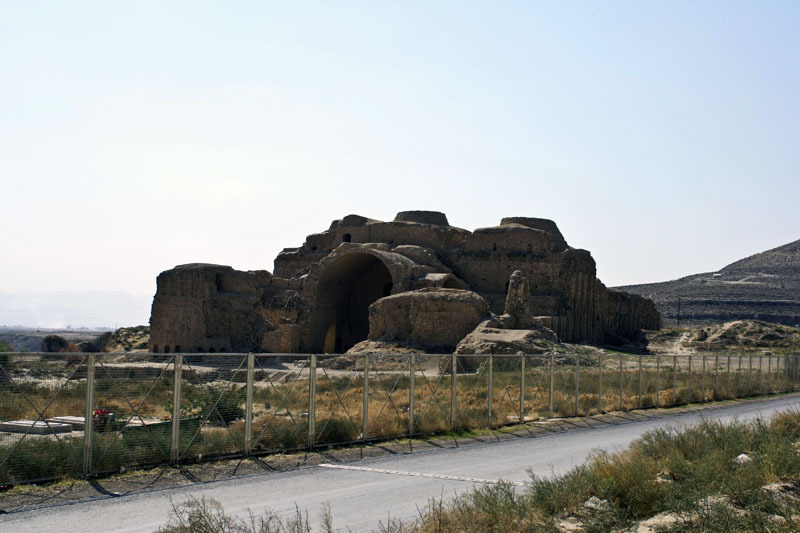 We'll never know - but the connection with Sasan, Zoroastrianism and the early kings of Fars was obviously very important to Ardashir, in helping to make out that his rule was genuinely connected with the Persian past. Papag (father or not) seized the kingship of Persis in around AD 205/6, when he ousted the ruler of Istakhr, capital of Persis (Fars). But when Papag died, his elder son Shapur, not Ardashir, was made king. Ardashir challenged Shapur to fight for his throne - but he died (in suspicious circumstances) before the battle. In AD 208 Ardashir became king of Persis. He duly murdered his other brothers, and crushed any local rulers who might be reluctant to accept him. He refused to recognise the Parthian Ardavan V as his overlord. The Parthians were right to be worried. Ardashir soon attacked Ctesiphon, with willing support from others who no longer trusted the Parthians - especially the Medes and other peoples from the north-west of the empire. 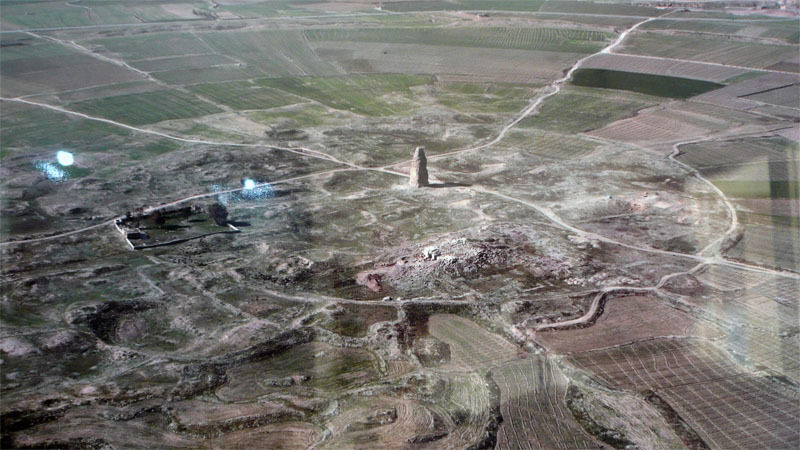 Ardashir defeated the Parthians in battle three times, finally and decisively at Hormozgan (location unknown) in April AD 224, where he personally killed Ardavan and "trampled his head", and was crowned king of kings . Two years later, by the time he took Ctesiphon, (AD 226). Ardashir controlled most of Iraq and the Iranian plateau. The Parthian nobles rapidly transferred their allegiance to Ardashir. Despite their role in undermining the authority of the Parthian kings, they wanted someone who could stand up to the Romans. Having imposed his authority on western Iran, in AD 227 Ardashir moved east, where a coalition led by the Arsacid king of Armenia (which included the formidable Kushans of Bactria) was determined to restore Parthian rule. Ardashir defeated them or bought them off, and recovered for Persia the territories of Makran (which now included the western coast of the Persian Gulf - the beginnining of Sasanian interest in Arabia), Sistan, Hyrcania, Margiana and Chorasmia. The Kushans in Bactria and India recognised his authority. Only Armenia remained - it took a ten year war to bring Armenia under his control. The unity of Iran was an important idea for the Sasanians - it wasn't just a matter of reconquering territory once ruled by the Achaemenids. 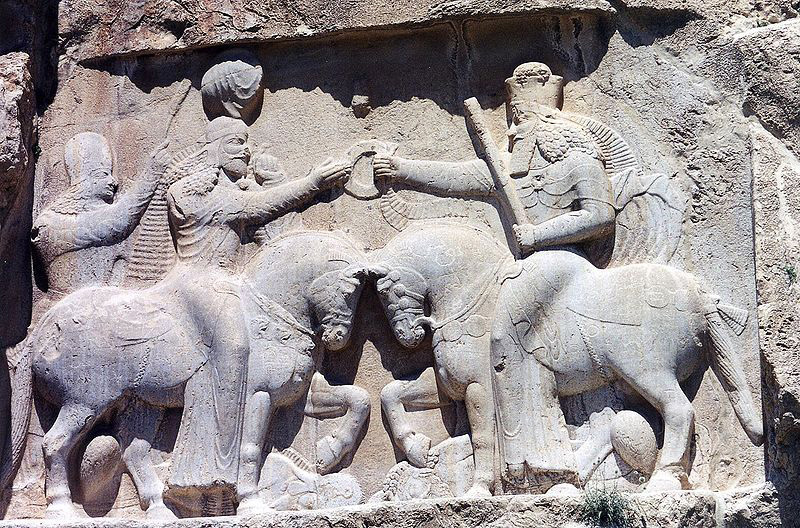 The land where they lived had been given to the Aryans/Iranians by Ahura Mazda - as demonstrated in the Naqsh-i Rustam relief (above). Mazdaean majesty, Ardashir, king of kings of Eran, who is descended from the gods. Click here for more pictures of Ardashir's Palace/Castle. Ardashir I establishes a new dynasty, the Sasanians. From his base in Persis (Fars), Ardashir soon routs the Parthians, and begins to rebuild Eranshahr - the home of the Iranians (Aryans). 'Ardashir' was a form of Artaxerxes, which had lingered as a name for princes of Fars. The Achaemenids themselves had by this time "receded into a legendary haze" (C E Bosworth), apart from Darius III (Dara), Victim of Alexander, whom Ardashir saw himself as avenging. The worship of Anahita (Anahid) and Mithra had been added to that of Ahura Mazda by Artaxerxes II. Perhaps her temple remained as a focus for the survival of Persian traditions. Although originally associated with water (along with Mithra, the sun - the two most important things for Persians), she was also a war-goddess (like Athena in Greece). Firdowsi's Shahnameh has a story which would seem to connect Ardashir's origin with that of Cyrus: he too was apparently raised by shepherds. Sasan was a shepherd working for king Papag of Persis. Papag dreams he sees Sasan riding a white elephant, with everyone saluting him. The wise men tell Papag that Sasan will become king. So he marries his daughter to Sasan, and their son is - Ardashir! According to Firdowsi, Ardashir is also descended from Dara - Darius III, Alexander's opponent (and half-brother accoring to the Shahnameh). Included in Eranshahr: Persis, Parthia, Babylonia, Mesene, Adiabene, Atropatene, Isfahan, Ray, Kerman, Sistan, Gurgan and Peshavar. 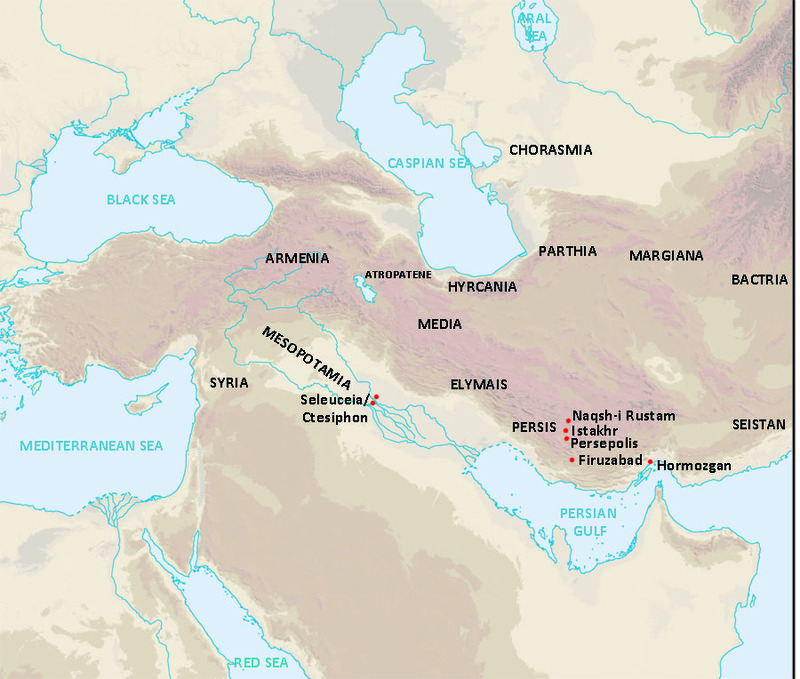 An-eran (not included): Syria, Cilicia, Armenia, Georgia, Albania, Balasagan - though all currently under Sasanian control. See "Neighbours" for more on these regions.